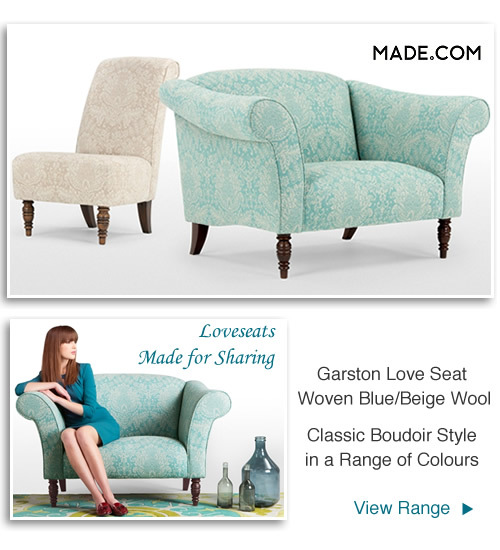 A recent arrival includes the gorgeous blue fabric love seat. Part of the Garston collection that comes in a range of styles and colours including cardinal red and grey velvet, beige and blue woven wool plus regal blue and deep pink. It’s all about detail with its beautiful floral pattern woven into the luxurious wool fabric, hand-turned legs and scroll arms making this a truly stand out piece. The boudoir design in muted tones conjure up images of a bygone era perfect for a romantic bedroom setting. Plush furniture in soothing blues and green have a calming effect and the rich textured material adds a touch of luxury. The whole collection is hand made in the UK and consists of accent chairs, love seats, 2 and 3 seater sofas plus matching cushions. Features of the Garston include comfy deep foamed cushioning and supportive seat. The fixed cover is made from a woven wool mix and the solid birch frame has an antique finish. An extra wide chair that gives plenty of room to relax alone in as well as space enough to snuggle up with a loved one. Dimensions W62 D92 H92cm. Discover more quality designs made to order and beautifully finished to fit seamlessly into your home. With no middleman or high street mark up prices are also kept to a minimum for great savings on everything including sofas, armchairs, swivel loveseats and garden chairs.